We're currently experiencing a temporary phone line outage for our 1-800 numbers. Please click here for a list of direct phone numbers. Number 1 Canon®DEALER IN THE U.S.
We’re committed to minimizing our carbon footprint – and helping you do the same. Older equipment is sold to wholesalers, who refurbish and sell them to overseas markets. Equipment that cannot be sold is shipped to a recycling center. The Gordon Flesch Company has reduced energy usage in its offices by using energy-efficient equipment and installing new lighting in our 38,000-foot warehouse, which has cut our energy consumption in half. The health and vitality of the communities in which we live and work is a strong, longtime focus of our company. We will continue to seek out new and innovative ways to lessen our impact on the environment—and provide energy-efficient, earth-friendly office product solutions for our customers. Making a positive impact on the environment is a priority for GFC. We strive to keep printer and toner cartridges out of landfills and increase the number of cartridges that are reused and recycled. To recycle the ink or toner cartridges for your device, click one of the logos below. We’ll Help Your Office Go Green! 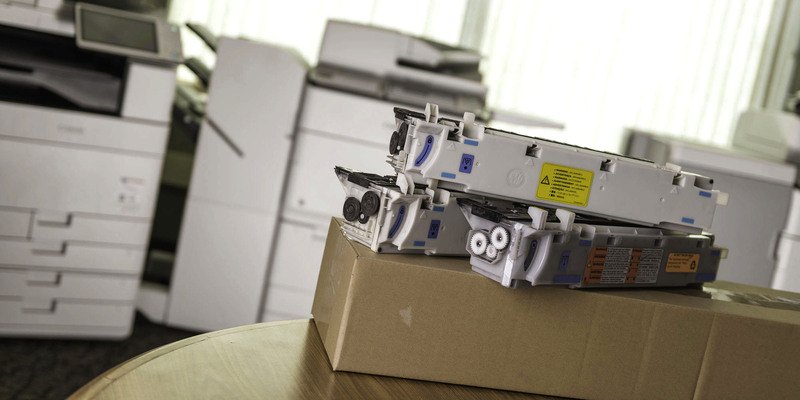 In addition to the recycling programs offered by our partners, we can help you integrate new technology into your business systems so you use less paper and less energy. Enterprise Content Management systems help you convert from paper to electronic files, and Managed Print Services programs helps you use your printers and multifunction devices more efficiently. We’ll be happy to include earth-friendly solutions on your customized Technology Roadmap. We’re ready – and eager – to help you solve your technology challenges.